Welcome to my home today as I am participating in this “Autumn’s In the Air Fall Tour”, so graciously hosted by Sheila Irwin from Maison de Cinq and Kim Hazel from Styled With Lace. 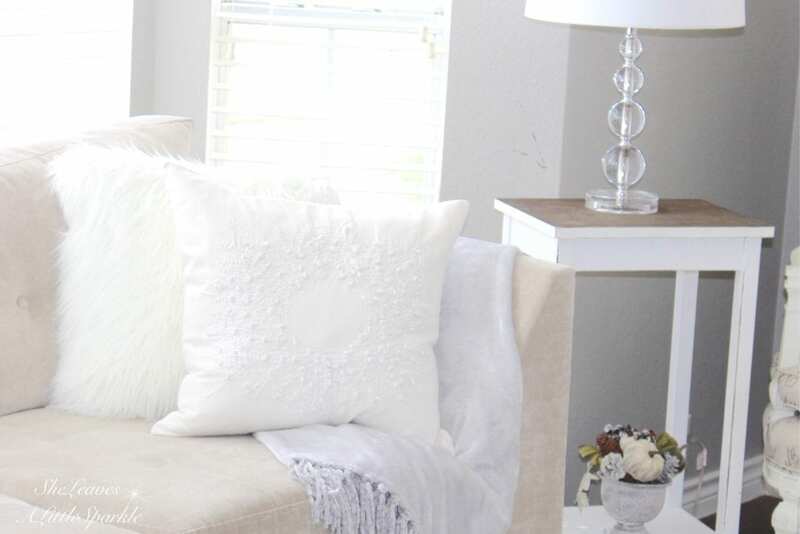 How much did you love Sarah’s home from Little Vintage Nest? She’s so talented and I love her home. I am sure you found some fall decor ideas you want to incorporate and I hope you find a few more here you love as well. Each blogger sharing today is so talented and full of fabulous ideas. Two weeks ago, I hosted the first annual “Harvest Haven Fall Tour – 2016” where I shared a few different areas of my home and how I welcomed fall. I’m sharing a few other simple ways to continue embracing this beautiful season and changing things up in your home. Let’s start with Brooklyn’s bedroom. This 10 year-old daughter of mine practically picked out everything she wanted for her Girls Tween Bedroom Makeover and I shared it here this summer. We changed a couple of small things and made it more cozy for fall. Not only did we add a soft blanket between her sheets and coverlet for extra warmth, but we also switched out her blush ruffle throw blanket, draped at the end of her bed, for a plush blush throw blanket. I love the texture and when you see it, you know cooler temps are upon us. I also adde the fur rug at the end of her bed. We opted not to do a bench in this room, since she has her vanity, so the fur rug was an excellent choice. It’s so cozy and she loves taking off her pretty slippers and having a soft place for her toesies before climbing on to her bed! It was so fun to find this blush velvet pumpkin! It’s the perfect touch of fall in her room! I just had a friend build this coffee table for me since I ran out of time. I really wanted to do it myself but he did a fabulous job! 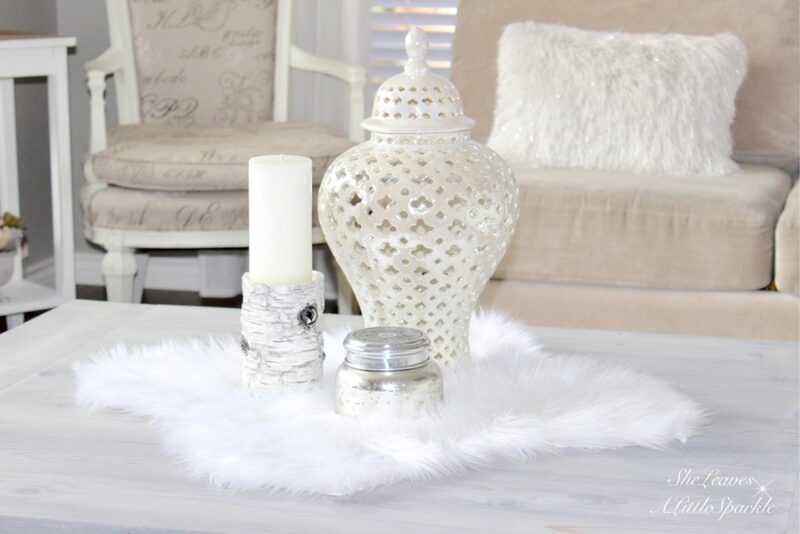 I threw a piece of faux fur on the table and added some beautiful bright decor and yet, with the birch candleholder, it adds an element of fall. I pulled out our soft, warm chenille throw blankets and draped them throughout the house. I even grabbed some mongolian fur throw pillows and switched out my spring/summer pillows. I absolutely love snuggling right there on a cool night, watching a movie with my family. I’m really excited about my new rug! I needed a larger rug for this room when I decided last week, on a crazy whim, to break one of big rules and separate my sectional sofa. It enclosed this room but I didn’t want to buy new sofas as we are renting this home until we move next year. RugsUSA sent me this fabulous area rug called the Bosphorus Floral Ornament Rug in ivory. This is the 9’x12′ and it’s the perfect size for this room. As temperatures cool down, we need that large area rug to keep our feet off the cold floor and on a cozy rug. I can’t tell you how much I love it. 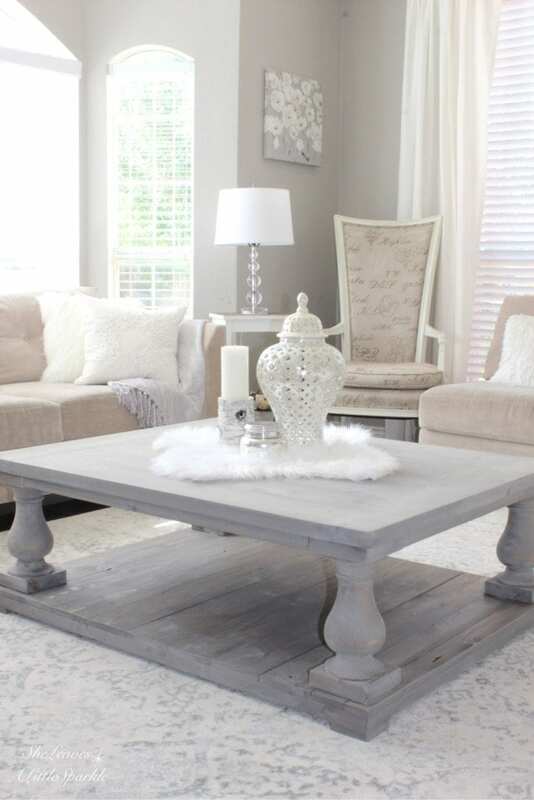 It’s the distressed look I was in search of and I love the ivory and light greys. They compliment the room instead of take away from it. It’s so beautiful and I’m very impressed with the quality! Just about every rug in my home comes from RugsUSA. Their prices and variety of styles can’t be beat! Switching up your rugs this time of year is a great idea for fall and winter so stop by RugsUSA and find something you love! I’ll definitely be posting plans on this coffee table in the next couple of weeks because the other plans we found online were off. We’ve made corrections and would love to share them with you! Make sure to subscribe to my email list at the top of the page for those updates and more! 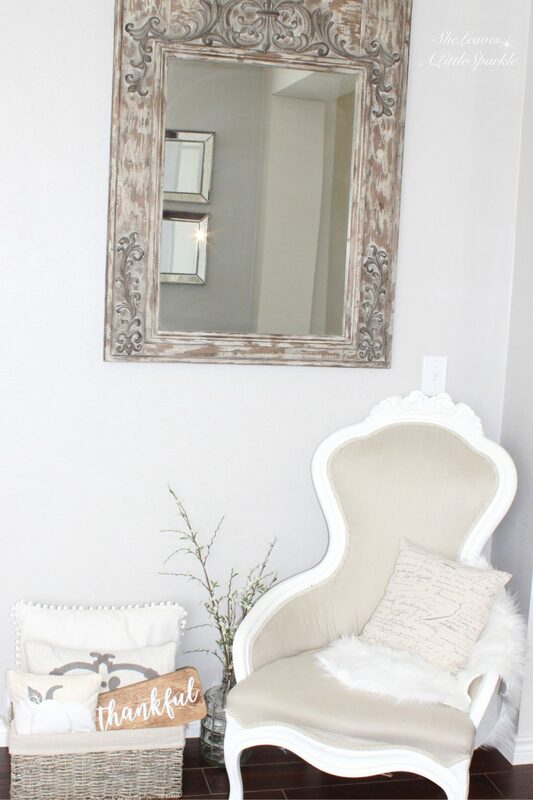 On the opposite corner of the room, I dressed up one of my favorite vintage chairs. All it takes is a small faux fur rug or a faux fur throw and it will give it that perfect cozy look. 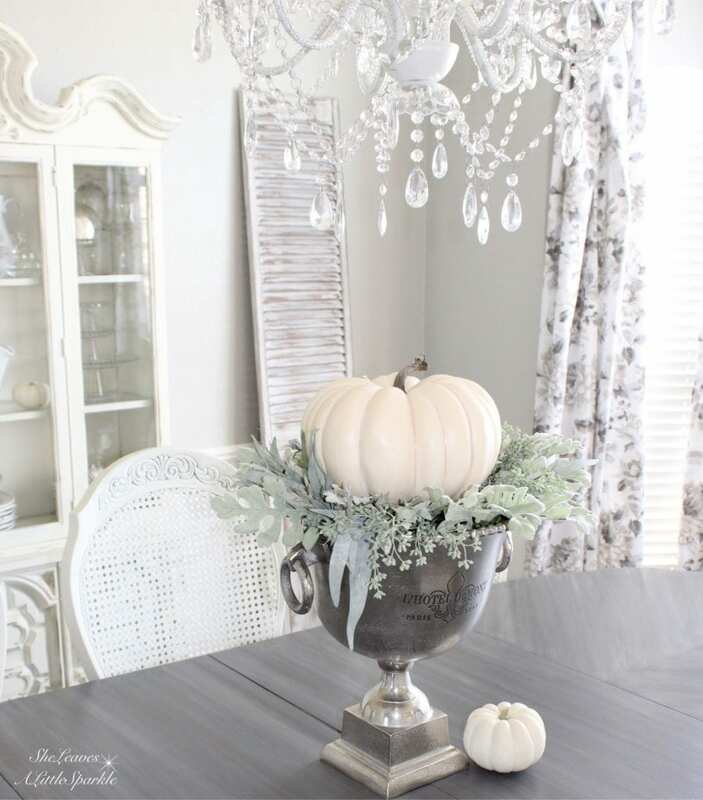 Today I’m inviting you into my Dining Room to see a special fall table I put together. A couple of months ago, I found some blush charger plates on clearance at Michaels, some gorgeous blush mercury glass hurricanes (which are hard to find and rare) and I knew I wanted to use them for my fall and maybe even a Christmas Tablescape. It is such a romantic setting filled with that element of glam that I love. Especially when I turn on the chandelier, it’s just so cozy and elegant. 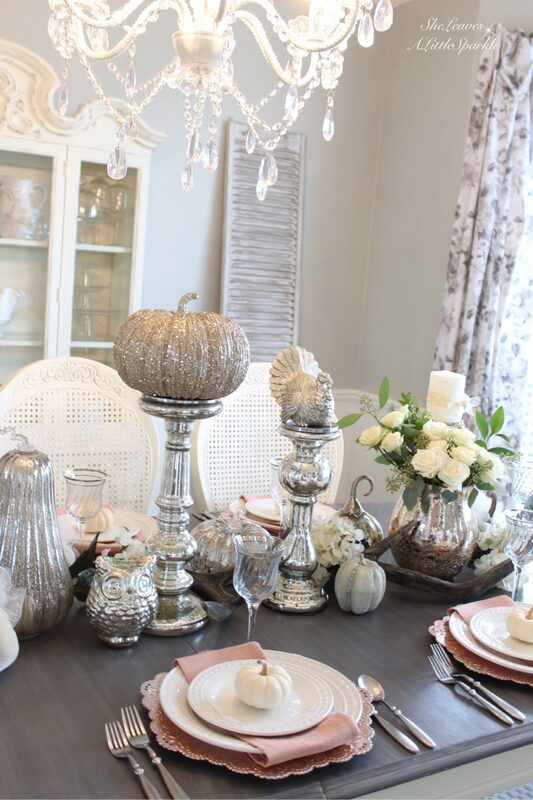 I love the way the light bounces off all the pretty glittery pumpkins and turkey and all of the mercury glass! If you have any fancy pumpkins, it’s easy to recreate this look. 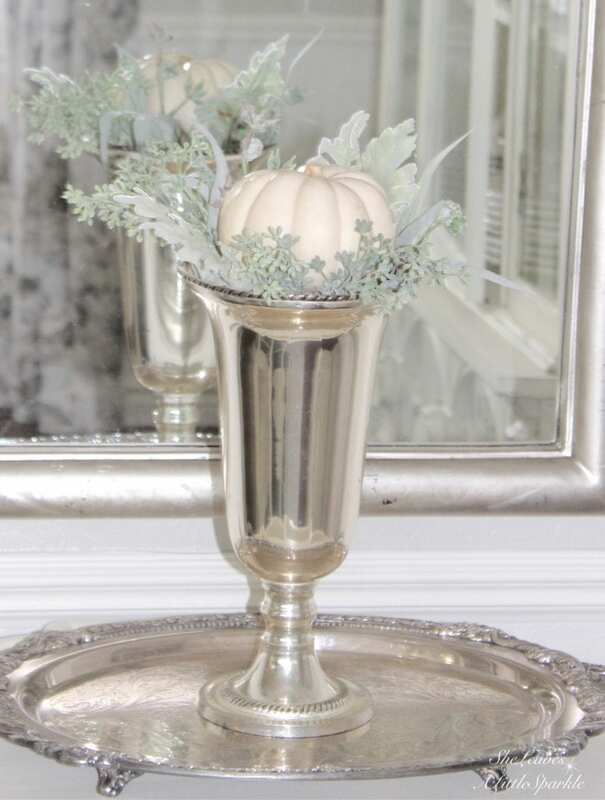 I grabbed my glass and glitter pumpkins, glitter turkey, hurricanes, candle sticks, faux deer antler, candles and some fresh white roses to place down the center of the table to create a runner. I am hosting Thanksgiving at my home this year, now that we’re back in Dallas, and I can’t decide if I want to decorate the table like this or one of the other ideas I have. I’ll share those with you soon in another blog post and let you tell me which one you think would be best. In the corner of the dining room, where I normally have a vase filled with fresh flowers in front of my tall mirror, I replaced it with Lambs Ear and a small white pumpkin for a simple topiary. It reminds me of a mini version of this one below that I shared in my last fall tour. I hope you found something today that inspired you! I’ll be sharing a few other fun spaces as the fall continues and as I get them finished. Try “shopping your home” and see what things you can move around and utilize to give your home a more cozy feel and welcomes autumn. I’m so glad you could stop by and hope that you’ll follow along on my social media sites like Instagram and Facebook and see what I’m up to next. Please follow me over to my friend Kelley Nan’s beautiful home for a special fall tour! Kelley is the perfect southern hostess and will not disappoint, I promise! Enjoy! And don’t forget to visit our other talented blogger friends participating in this beautiful tour! Thanks again for stopping by and have a beautiful fall season!! 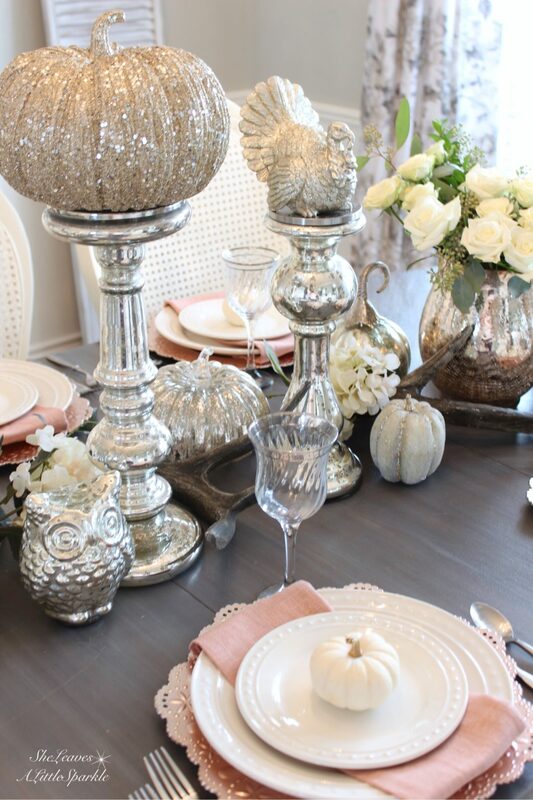 Summer, you had me at “glittery pumpkins!” I’m a sucker for bling, and your dining room is full of it … from those fantastic pumpkins … to the mercery pieces … to that gorgeous chandie! Your Thanksgiving guests will want to linger a long time around your table, whether you leave it like that or play with another, undoubtedly, fabulous tablescape! I love how you incorporate cozy throws and rugs to add to your Fall home, too … yes, such a cozy factor! 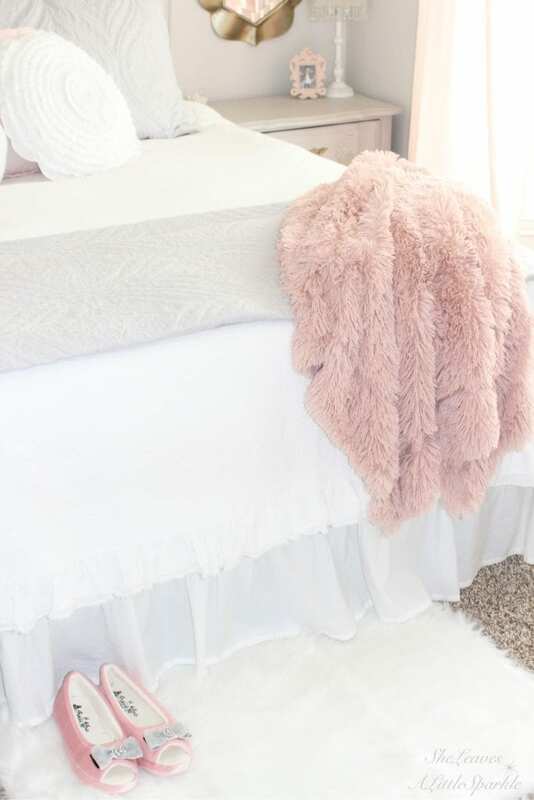 Your daughter’s bedroom is swoon worthy … love her blush velvet pumpkin … lucky young lady! I look forward to seeing more of your seasonal home and am happy I got to participate in this fun Autumn blog hop with you! Bree, that is such a huge compliment coming from you! Thank you so much, sweet friend! I could have a fur in every room ( and I’m just about there 😉). Have a wonderful day! I love it all! You have such a classy home Summer, I’m always amazed by the beauty! So honored to do this fall blog hop with you! Oh gosh Sarah, that is such a nice compliment… Thank you sweet friend! Love collaborating with you always! xoxo!! Well I’m tickled pink!! You’re the cutest and so very gracious and sweet, as always! Always love doing a tour with you! Xoxo!! Everything you do is so beautiful and glamorous, Summer! 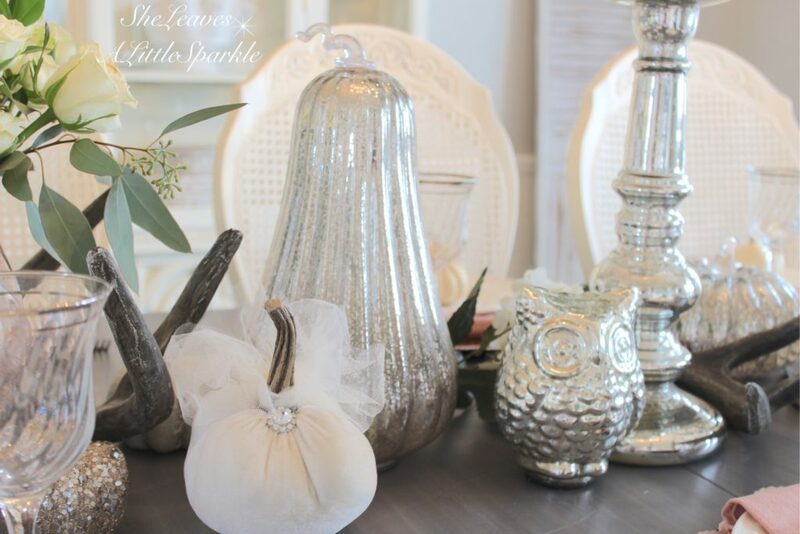 I just love all of the fall sparkle that you added to your home! That coffee table is AMAZING, and I love your sweet daughter’s room! Beautiful tour, friend! Wow!!! Everything you do is gorgeous!! I want to copy it all!! Love the tablescape! Welleverything!! From the queen bee herself! I learned from the best… Thanks for all your sweet compliments. Love you! Summer!! This is truly such a gorgeous tour!! 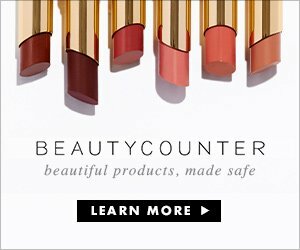 Your use of blush, sparkle, and glam for Fall is totally brilliant! I adore everything about your home! 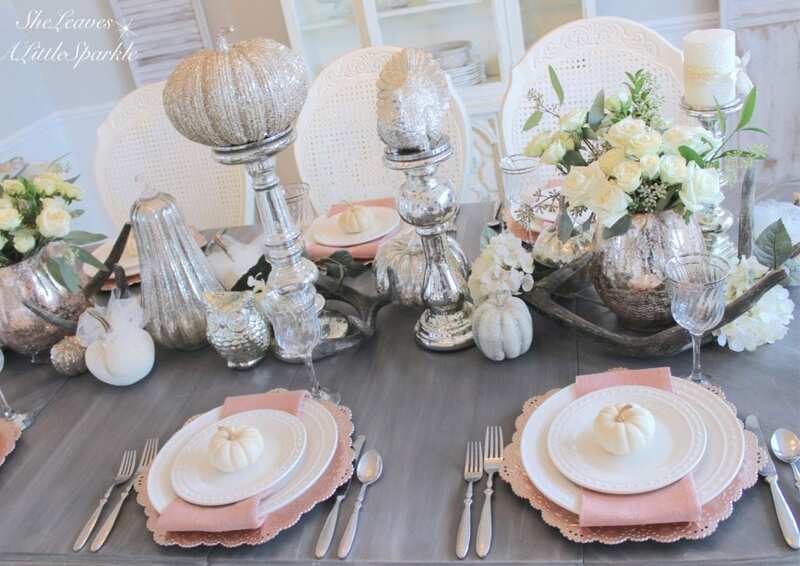 That blush velvet pumpkin is so darling, and I love your new coffee table, and can we talk about your table setting!! Swoon! I could go on and on… Thank you so much for being a part of this tour, so honored to team up with you again! You did SUCH an amazing job with your whole home for Fall! 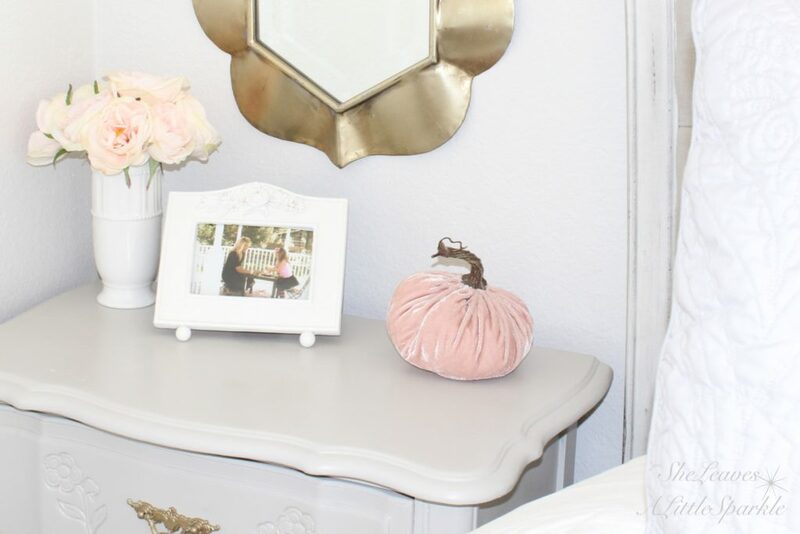 From your daughter’s adorable room (that blush velvet pumpkin is TDF! 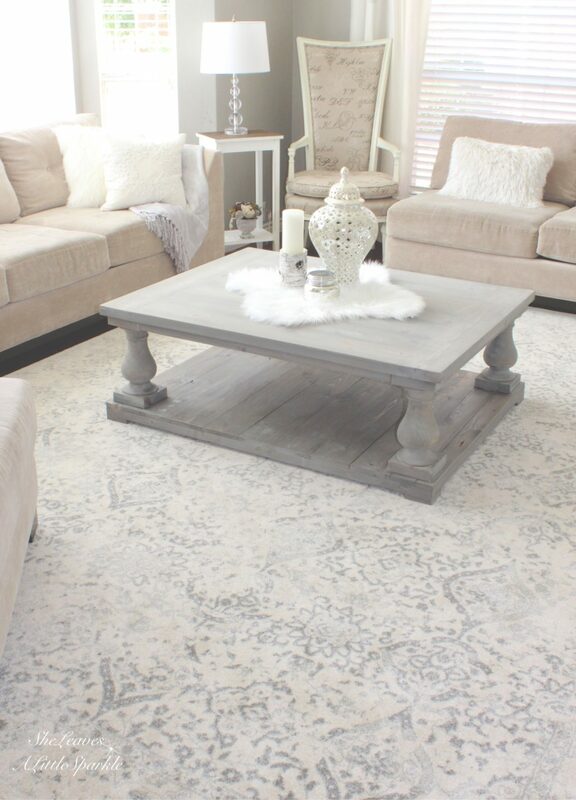 ), to your new coffee table and rug (LOVE both of them!) to your gorgeous tablescape, you really outdid yourself! Summer! I am just oohing and awing over everything! First, that coffee table turned out AMAZING! And the rug is so elegant and beautiful, totally to die for! What really had me going was your fall tablescape!! 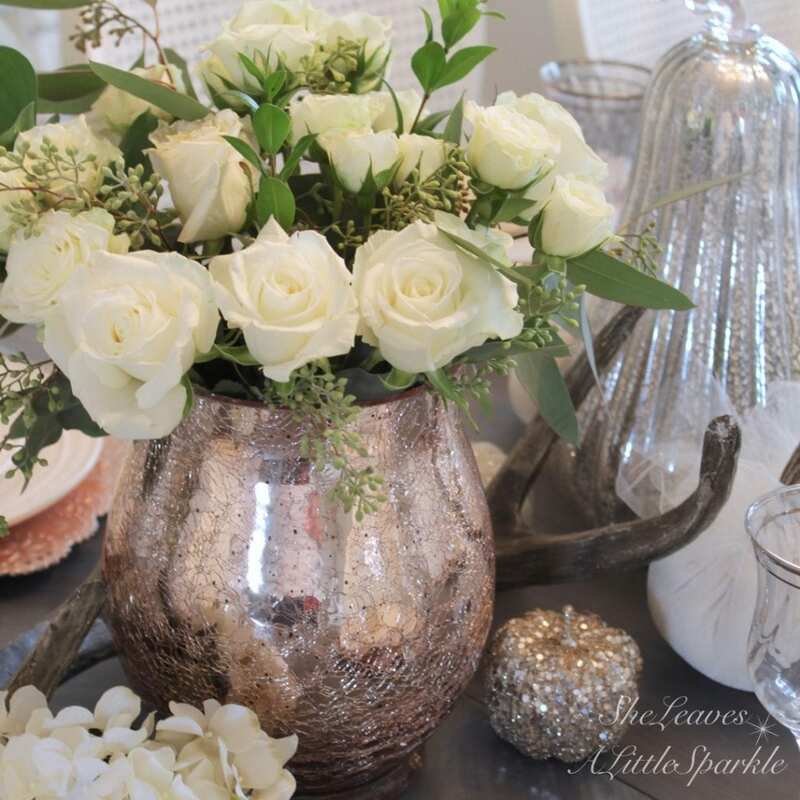 I love that rose gold pink shade in there with all the glittery pumpkins and beautiful flowers! Quite the masterpiece! So glad to have gotten to do this fall tour with you! Aw Lacey! That is so very kind of you, thank you my talented friend! Loved doing a tour with you again! I love how glamourous your decor is. I adore the touches of pink mixed with the mercury and neutral! Thanks so much for sharing with us! I adore all the blush pink and sparkly bits, but that coffee table is the bomb! Thank you so much! I was so happy with how it turned out! 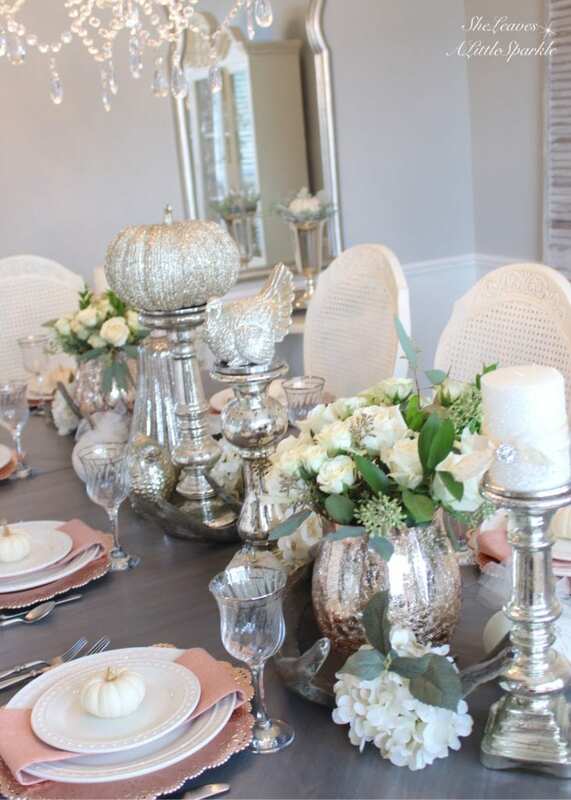 Love the subtle use of pinks and then of course all the sparkly glam you add to your spaces!! Beautiful! You have such elegant style. I love the white and silver with a touch of pink. Would love to see your new home once you have moved in and decorated it. Everything looks so inviting and beautiful!